In the 1936 Olympic games in Berlin, a single man captured the attention of the world, winning 4 gold medals, an Olympic first. Sixty years later, thousands gathered to honor this man with the dedication of a park named in his honor, the Jesse Owens Memorial Park. Dedicated on June 29, 1996 with the arrival of the Olympic torch on its journey to the Summer Games in Atlanta, JOMP is a tribute to the Olympic track and field superstar. 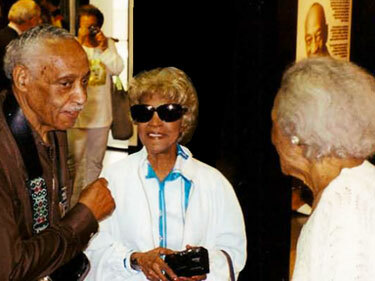 Sylvester Owens (Jesse’s brother) and Ruth Owens at the Museum Dedication in Oakville, Alabama. The park showcases several memorials for Owens including a museum, statue, replica home, broad-jump pit, 1936 torch replica and an oak tree of the same variety as Owens’ gold medal tree. The park’s goal is twofold- to honor the life and accomplishments of this remarkable man and to mirror Owens’ dedication to America’s youth by investing in the community. The Jesse Owens Memorial Park and Museum immortalizes Owens’ memory by depicting the moments that made Owens great and portraying the people who shaped him as an athlete and as a man. Glass display cases showcase rare memorabilia including programs from the 1936 Olympics, replicas of track uniforms and shoes, medals, and trophies from Owens’ high school days. In addition, the museum offers visitors interactive kiosks that highlight Owens’ life and accomplishments. 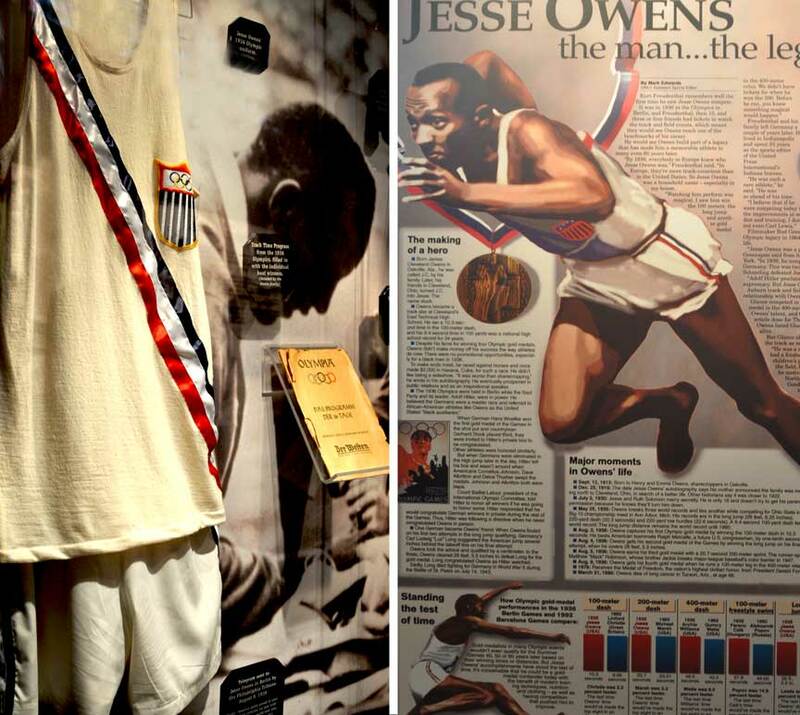 Replicas of track uniforms, shoes, medals and trophies are displayed in the museum as well as interactive kiosks that highlight Owens’ life and accomplishments. The museum’s mini-theater shows the movie Return to Berlin in which Owens narrates the 1936 Olympics. Visitors can follow the larger-than-life panel displays throughout the museum that depict Owens’ life beginning in Oakville, Alabama to his death in 1980. The panel displays highlight Owens’ athletic accomplishments as well as his humanitarian efforts. For those interested in learning more about the life of Jesse Owens, the museum offers The Decatur Daily Resource Center. Equipped with computers and printers, the center allows visitors to do their own research of this Olympic gold medalist. 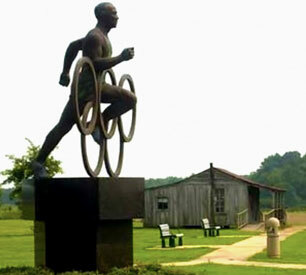 Jesse Owens bronze statue with his birth home replica in the background. Oakville, Alabama. The park provides facilities for community use such as a basketball court, baseball/softball fields, playground, picnic tables and pavilions. A final phase goal is construction and completion of an Olympic track. The Park is ideal for group tours and field trips.